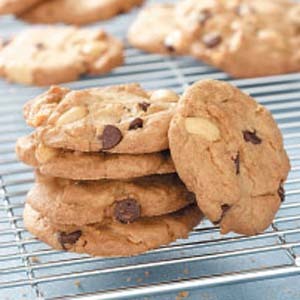 This Salted Peanut Cookie from Taste of Home cookie recipes, which is a popular favorite with many. This recipe seems to get her friends and family running for more. In a large mixing bowl, cream shortening and sugars. Add eggs, one at a time, beating well after each addition. Beat in vanilla. Combine the flour, baking soda and salt; gradually add to creamed mixture. Stir in chocolate chips and peanuts. Drop by tablespoonfuls 2 in. apart onto greased baking sheets. Bake at 350° for 10-12 minutes or until lightly browned. Remove to wire racks.